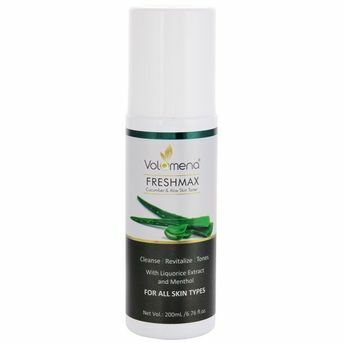 Embrace the fresh, clean, soft, soothing feel on your face with the gentle, alcohol-free Volamena Freshmax Cucumber Aloe Skin Toner; carefully designed to cater all skin types, even the sensitive type, thoroughly cleanses and unclog your pores without overly drying out your skin, leaving no greasy residue. This safe and organic makeup remover is enriched with Cucumber seed oil and extracts beneficial in reducing puffiness, redness, and oiliness. Aloe hydrates through three epidermal layers of the skin when used topically Liquorice is known for skin lightening properties. Menthol smooths and soothes facial skin when sprayed as mist. This toner acts as a direct astringent, minimizing your pores, thus reducing the risk of blackheads and blemishes from appearing. It also acts as an aesthetic purpose by reducing the appearance of pores around the nose and cheek area. The cucumber extract soothes and regenerates your skin, relieving it of any irritation. This toner also contains aloe vera which gives your skin moisture and acts as an SPF, protecting your skin from the harmful rays of the sun.